PowerBook, iBook, iPod, and other portable computing is covered in The 'Book Review. News about Apple's transition to Intel CPUs and other Intel developments is covered in The Macintel Report. iPod news is covered in The iNews Review. PR: It has been just ten short years since Contour Design, Inc., headquartered in Windham, NH, introduced its multiple award-winning Perfit mice. With nearly 150,000 of them shipped worldwide, Contour has followed these revolutionary, formfitting for both right- and left-handed users, mice with an even more extraordinary RollerMouse product line. Even more recently, to aid in the battle against HAI (healthcare associated infections), has come the introduction of the MediMousePro line of IT products that can be disinfected for safe use in "red zone" environments. Recognizing over ten years ago that software application products, especially the CAD/CAM products of that era, were placing inordinate demands on users through mousing operations, Contour developed and began marketing the Perfit (contraction for Perfect Fit) family of mice. It took several years of rigorous alpha and beta testing to perfect the design and release the product in 1995. Since that time, the original Perfits, with embedded ball-equipped positioning mechanisms have been replaced with the latest state-of-the-art optical drives and improved button hardware and software. As new and pervasive software applications have followed the lead of the earlier CAD/CAM solutions, the demands for more intensive mousing have moved into the offices, call centers, and - more recently - the healthcare industry. This industry is being motivated by cost containment, needs for improved healthcare delivery, and pushed by the Federal Government to upgrade their operations into EMR/EHR (electronic medical records/electronic health records) systems. The "spill-over" effects resulting from these upgrades has been a marked, alarming, and expensive rash of repetitive strain injuries (RSI) among endusers who blame such injuries on reaching for a mouse.ection 508 of the Federal Rehabilitation Act provides for a centralized repository - a database - of information where Federal agencies (and private citizens, should they choose to do so) may go to find information on products that their manufacturers claim to be compliant with the Act. The database is a valuable resource for gaining information about products that may be of use in helping to accommodate a certain disability - or in finding a product that will help prevent or provide remedial help with a repetitive strain injury (RSI), such as Carpal Tunnel Syndrome (CTS). Contour responded with its "classic" RollerMouse then did a "one-plus" on that innovative design with the RollerMousePro, introduced at NECE 2004. Subsequent to this introduction, the RollerMouse has been integrated into public and private sector computing operations on a worldwide scale. Over the past year since it was announced the product has won a plethora of awards. The Contour parade of new products just keeps marching on. At this year's NECE (Booth 347) Contour will be competing for an Attendees' Choice Award for its recently announced MediMousePro line of products. In response to global concern for the problem of HAI (healthcare-associated infections) which annually affects some 2 million Americans, killing a reported 90,000 of them, Contour has introduced this family of products. Contour Design's MediMousePro product line includes high duty cycle mice for mousing-intensive work and low-duty cycle mice for hospital carts. These products come with medical-grade polyurethane covers for disinfecting to prevent the spread of HAI (healthcare-associated infections); and accompanied with similar-grade covers for keyboards, notebook computers, and touch screen displays. "It is only fitting that NECE 2005 is the venue for the celebration of our tenth year of making exceptional ergonomic products." Says Steve Wang, Contour's founder, CEO, and chief design engineer. "We take a great deal of pride in our ability to anticipate needs users have for computer input devices that are safe and comfortable to use, that aid them in doing their jobs, and - in the case of the new MediMousePro line - helping to combat the serious problem of healthcare-associated infections." "Improving an excellent machine was the happy challenge facing Apple Compute designers as they worked up new versions of the iMac G5 desktop. Against the odds, they have succeeded. Though the changes in the new 17-inch ($1,299) and 20-inch ($1,699) iMacs are relatively small, they help keep it atop the heap as the best consumer desktop around. "The updated desktop boosts its already impressive credentials with some nifty tricks, user-friendly features, and the odd gimmick." "The Daystar upgrade gives the . . . iMac G4 Flat Panel a new lease on life. We saw 39 to 100% gains in speed with productivity apps when comparing the original 1.25 GHz processor to the 1.92 GHz upgrade. You'll see even bigger gains if you have a 1 GHz processor in your iMac G4 Flat Panel." PR: Chwang Yi Company has announced the availability of The Ball, the world's first Bluetooth wireless trackball. The Ball is the result of a two-year design effort and represents an entirely new approach to the concept of a 'trackball.' With a robust wireless system based on leading Bluetooth v1.2 standards, an elegantly small physical size and design, and a basic two-button plus scroll wheel control layout, The Ball sets a new standard for simplicity and ease of use for trackballs. The left and right button actions are created by the top surface pivoting to the left or to the right, when pressed with the fingers. The Ball easily pairs with any Bluetooth wireless enabled Mac or PC running OS X 10.2.3 or higher, or Win XP SP2 or higher. The Ball includes rechargeable AAA batteries, a USB-powered mini docking/charging cradle, and, has an on-off switch for power conservation. Free MouseCommand software offers even more flexibility and control on a Mac running OS X 10.2.3 or higher. Preorder your The Ball for only $69. First 500 preorders will ship by December 5th. The next 500 preorders will ship by December 15th. U.S. orders shipped via USPS Priority Mail. Priced at $69, the Ball is available now for preorder and will begin shipping on December 5th. PR: Maxtor Corporation has announced that demonstrations of its award-winning Maxtor OneTouch II, FireWire 800 Edition are now being featured at 115 Apple retail stores across the U.S. Ideal for computer power users, digital content creators and creative professionals alike, the Mac-friendly storage and backup solution is available for purchase at Apple retail and online stores, making it easier for Mac users to easily protect their digital memories, professional creations and personal documents. The Maxtor OneTouch II, FireWire 800 Edition storage solution features a triple interface for universal connectivity and ease of use. Consumers can connect the drive to their system using one of its FireWire 800, FireWire 400 or USB 2.0 interfaces, depending on application performance needs. FireWire 800, the highest performing FireWire external drive interface on the market today, provides twice the bandwidth of FireWire 400 and is more than 50 times faster than USB 1.1. By selecting the Maxtor OneTouch solution, users have peace of mind knowing that their photos, music, videos and other important files are stored on the industry's leading brand of external hard drives. The storage solution also features a sleek, slim design and cool operation. Using the FireWire interface, the Maxtor OneTouch II drive is fully bootable on a Mac computer running OS X system software. No additional software or hardware is required. "Digital photographers and users of iMovie and Final Cut Pro need enough space to safely store their large photo and video files," said Stacey Lund, vice president of marketing, Maxtor Branded Products Group. "This large- capacity, blazingly fast storage solution fits the bill perfectly, and backs up all your digital content automatically or with the single push of a button. We're pleased that Apple recognizes the Maxtor OneTouch II, FireWire 800 Edition as a 'must have' on this year's annual holiday wish list." With every Maxtor OneTouch II, FireWire 800 Edition storage solution, consumers receive Maxtor's award-winning backup package. This includes the Maxtor DriveLock feature for added security and an exclusive version of EMC Dantz Retrospect Express HD software for simple backup and restore. The storage system features a simple user-friendly interface for easy setup and navigation. The manufacturer's suggested retail pricing is $229.95 for the 200 GB capacity and $299.95 for the 300 GB capacity. Maxtor OneTouch storage solutions are available worldwide. PR: iEmulator 1.7.8 now offers audio playback from within the emulated PC, emulating an industry-standard sound card for maximum operating system and application compatibility. "I can't tell you how many customers have asked for sound support" says Richard Peters of iEmulator.com. "Audio wasn't scheduled to be available until early 2006, but we're pleased to offer it now. It's a phenomenal implementation as well - in my opinion it's quite possibly the most efficient audio emulation of any PC emulator on the Mac platform!". Physical CD-ROM handling is also improved, as is the ability to import PC profiles from Virtual PC 7.0. Despite regular updates and constant improvements, iEmulator's price remains at $23.95 U.S., and all updates always have been and always will be free of charge to all customers. iEmulator also includes all of the great features from previous versions of the software, including the ability to assign up to 1 GB of RAM to each emulated PC, virtually instantaneous PC state saving and loading, full-screen as well as windowed mode, printing support, support for international keyboards, CD image as well as physical CD-ROM support, the ability to access Mac files and folders from Windows and support for running multiple instances of iEmulator simultaneously. In addition, iEmulator.com continues to set the benchmark for customer support and service. From simple thank yous for a quick tip to comments like "iEmulator is fantastically easy to use. I was so glad to find such an affordable, user friendly program. ", "your support is second to none: friendly and amazingly quick!" and "I am dubbing iEmulator - the BEST way to run Windows." iEmulator.com is proving that it has consistently set customer satisfaction as the goal above all else. iEmulator is a high-performance PC emulator for the Mac OS X platform that has been available since November of 2004. PR: Peerless Industries, Inc., a leader in audio/visual mounting solutions, has introduced the LCS-KLA LCD Flat Panel Articulating Wall Arm, a new value-priced mounting solution for 10"-22" LCD screens used in both professional and home environments. "The LCS-KLA arm is ideal for professional LCD monitor applications that require retractable extension from the wall and easy movement of the screen's position- like office or industrial settings" said Michael Jasinski, associate product manager for Peerless Industries. "This new mount is also an affordable add-on for consumers who purchase an LCD screen as a holiday gift, greatly increasing the value and utility of their purchase without hurting their pocketbook." Extremely flexible and weighing a mere two pounds, the LCS-KLA features a sturdy two-link arm that can extend from the wall up to 15.25" then fold flat to a slim 2" depth. To ensure optimal screen positioning and an extensive range of viewing angles, the new mount features an adjustable three-hinge pivot system with tension control, a one-touch tilting mechanism that ranges +/- 35 degrees and up to 180 degrees of swivel. The LCS-KLA mount includes a VESA 75/100 mounting plate for compatibility with almost any 10"-22" LCD screen. It comes pre-assembled out of the box with all the necessary hardware to allow quick setup and easy installation. Featuring a scratch-resistant fused epoxy finish for durability in a wide range of applications, the LCS-KLA is available in silver to complement both the screen and the room. 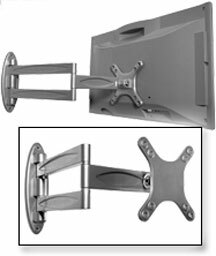 The LCS-KLA LCD Flat Panel Articulating Wall Arm Mount is available now for an MSRP of only $99. For more information about Peerless' wide assortment of mounting solutions, please call (800) 865-2112 or visit the Peerless website. PR: GizMac Accessories LLC, designer and manufacturer of innovative products for the Apple platform, announces XRackPro2 featured on revised Apple Workgroup Cluster web site pages. XRackPro2 is a rack mount enclosure cabinet designed to reduce noise and add mobility to Apple's Xserve line of servers and RAID systems. Noise from rack mount equipment located inside the XRackPro2 will be reduced up to 75% while the heavy duty caster wheels provide a method for easily moving the rolling rack enclosure cabinet when needed. "XRackPro2 was originally designed for the Xserve server and Xserve RAID," says Tim Cave, founder of GizMac, "We are pleased that our noise reduction rack mount enclosure cabinet became part of the Apple Xserve Workgroup Cluster." XRackPro2 rack mount enclosures are used in scientific and medical work groups, video and audio post production, film and broadcast applications, graphics, animation, prepress, military and any other environment that needs noise reduction and/or flexibility of equipment location. Additional information on XRackPro2 and GizMac can be found on the XRack Pro website. PR: Maxell Corporation of America and InPhase Technologies are bringing a revolutionary technology to market - holographic media. With storage capacities achieving 1.6 TeraBytes per disk and data rates as high as 120 MBPs, holographic technology is a true breakthrough in optical media. These features, along with a long archival life, make holographic media a compelling choice for storage and archival requirements. Holographic data storage is superior to existing disc and hard drive technologies, and is also competitive against tape technologies in capacities and transfer rate. In addition, it offers a 50+ year media archive life and random data access. Finally, the media is expected to have the lowest cost per gigabyte of any commercial quality removable storage. "Holographic media makes it possible for millions of pages of information and high definition images to be held on one small, relatively inexpensive disc," said Steven Pofcher, senior marketing manager at Maxell. "Imagine having a person's entire medical history, complete with MRI images, or storing a broadcast network's entire HD Library on a single disc. These are both possible with holographic technology, which has such large capacity that approximately a half million 300-page books can be stored on a single disc." Holographic recording technology utilizes intersecting signal and reference laser beams to store data in a number of 3D hologram images capable of saving hundreds of data pages in a single location. One 5 1/4 inch-diameter optical disc can store up to 150 million pages - more than 63 times the capacity of DVD. Also, with holographic recording, a multiple of form factors, such as discs, cards, etc., and laser wavelengths (red, green, and blue) can be used. "Combining high storage densities and fast transfer rates with durable, reliable, low cost media, Holographic technology is poised to become a compelling choice for next-generation storage and content distribution needs," said Liz Murphy, vice president of marketing for InPhase Technologies. "Unlike other technologies that record one data bit at a time, holography allows a million bits of data to be written and read in parallel with a single flash of light. This enables transfer rates significantly higher than current optical storage devices." The first generation of holographic media is scheduled for release in September 2006. For deals on laptops, see our Best Aluminum PowerBook G4 Deals, Best Titanium PowerBook G4 Deals, Best iBook G4 Deals, and Best White iBook G3 Deals. For deals on iPods, see our Best iPod Deals.